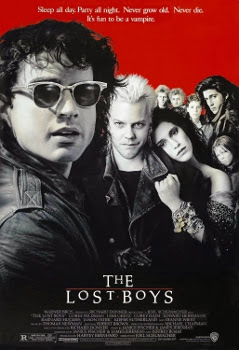 The Lost Boys was released into theaters on July 31st, 1987. 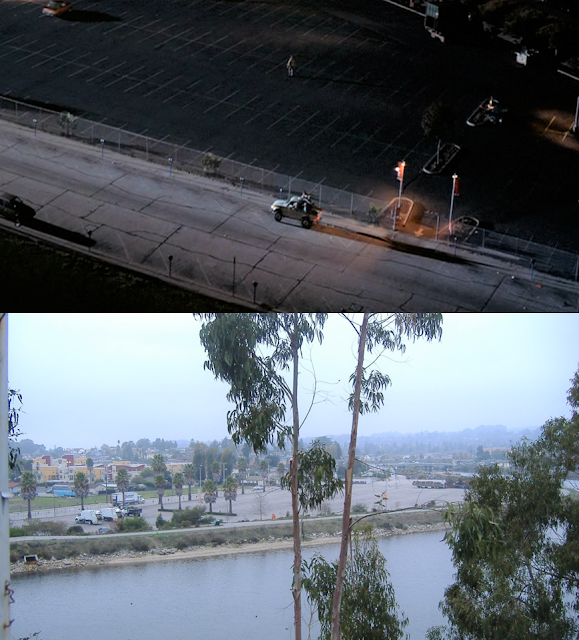 Filming locations include Burbank, Rancho Palos Verdes, Santa Cruz and Valencia, Ca. The film was directed by Joel Schumacher, who would go on to direct genre film Flatliners, three years later. This was the film that Corey Feldman and Corey Haim initially met one another on. Including The Lost Boys, they would end up appearing in nine films and one television show (The Two Coreys) together over the span of their careers. The film features a stellar cast overall, with a blend of young, up coming actors along with established veterans. It also has a perfect score/soundtrack combination. The fabulous score was written and composed by Thomas Newman. But shockingly, aside from To the Shock of Miss Louise, it was never released as part of the films official soundtrack, or at all for that matter. However, if you look in the right places on the internet you'll be able to find almost the entire score. The soundtrack features a variety of rock themed songs and was one of the most popular rock soundtracks of the 80's. Some of the songs included are Lost in the Shadows (Lost Boys) by Lou Gramm, People Are Strange by Echo & The Bunnymen, Cry Little Sister by Gerard McMann and I Still Believe by Tim Cappello. The films first DVD release was on January 28th, 1998. One location that has eluded me over the years, that I'd love to find, is Max's house. The boardwalk opened in 1907 and is California's oldest surviving amusement park. 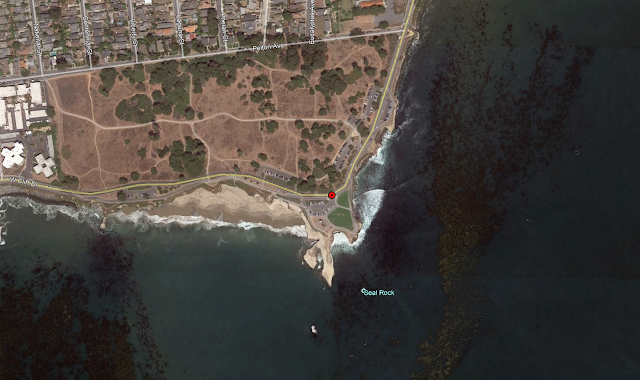 It extends along the coast of Monterey Bay from the Santa Cruz Municipal Wharf south to the mouth of the San Lorenzo River. One of the boardwalk rides featured in the film is the Looff Carousel. It was made in 1911 by Danish woodcarver Charles I.D. Looff. Music for the carousel is provided by a 342-pipe Ruth und Sohn band organ built in 1894 and has played alongside the carousel since it first started operating. The cost of the carousel in 1911 was $18,000. Today, just a pair of the Looff horses featured on the ride are valued at more than that. Another ride featured in the film is the Giant Dipper roller coaster. It was built in 1924 by Arthur Looff, son of Charles I.D. Looff. It's currently the fifth oldest coaster in the U.S. that has continuously operated in it's original location. It's seventy feet high, 2,640 feet in length and travels up to 46 miles per hour. 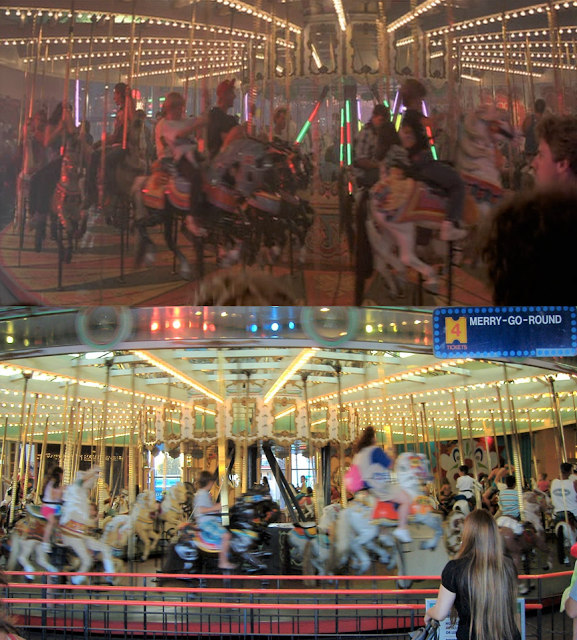 The Looff Carousel and Giant Dipper were both listed as National Historic Landmarks in 1987, coincidentally the same year as the film was released. The concert stage used in the film was destroyed in the 1989 Loma Prieta earthquake. 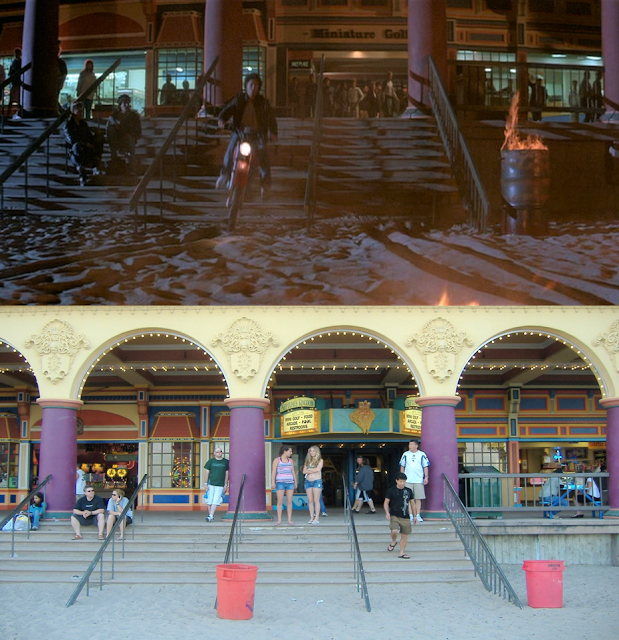 Despite this, the boardwalk still hosts a free "Friday Night Bands on the Beach" concert series every weekend June through August as well as a "Free Movies on the Beach" every Wednesday, June through August...with The Lost Boys usually being the first movie shown of the season. 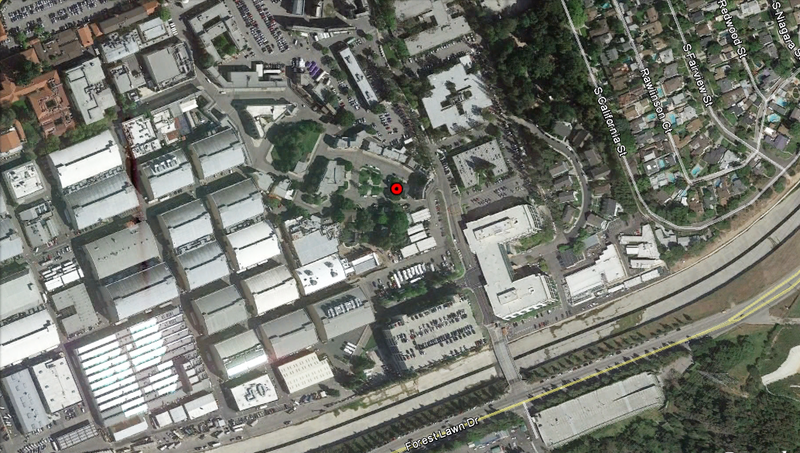 The parking lot where the security guard get's killed is between 3rd St. and the San Lorenzo River. 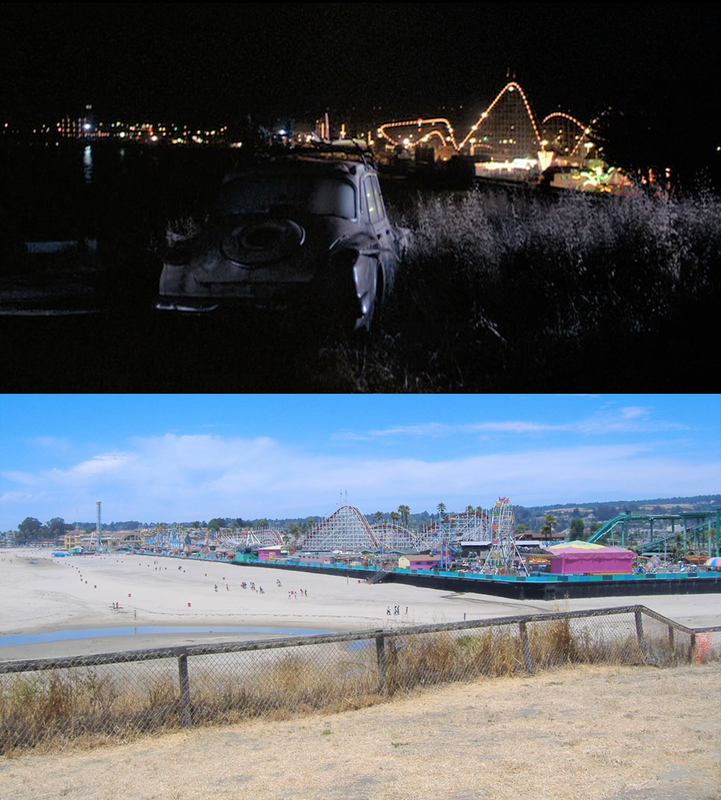 Other notable movies filmed at the boardwalk over the years include Bumblebee, Chasing Mavericks, Dangerous Minds, Killer Klowns from Outer Space, Sudden Impact and Us. All "Now" pictures taken in 2007. In the initial shot of Lucy, Michael and Sam driving into Santa Carla in their 1968 Toyota Land Cruiser, they're driving south on W. Cliff Dr. through Lighthouse Point Park and past the Santa Cruz Surfing Museum. They eventually pass a "Welcome to Santa Carla" billboard which was obviously constructed for the film. The Santa Cruz Chamber of Commerce wasn't too keen on having their town dubbed "The Murder Capital of the World" so they made the filmmakers agree to change the name to the fictional town of Santa Carla. Today, in the spot of the billboard, sits an 18-foot bronze surfer statue which was erected in May of 1992. The name of the business that the whale snout protruded from is Day's Market and it's been in operation since the 1920's. 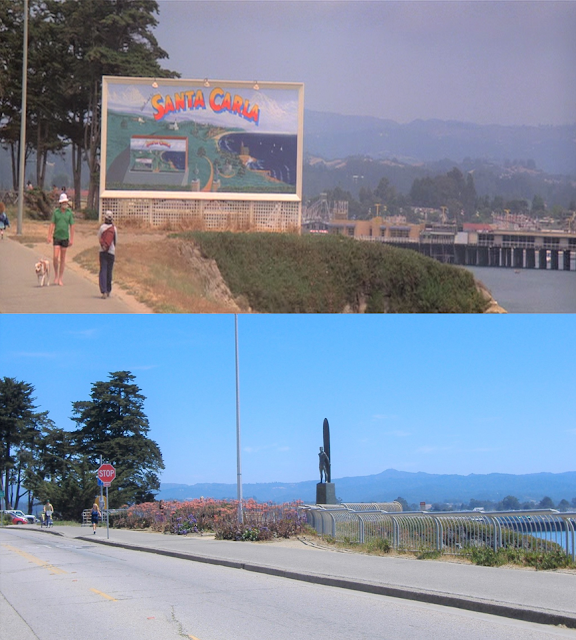 The first time I visited Santa Cruz in 2007, while at the boardwalk, I had a conversation with a local police officer about the filming locations for The Lost Boys and he told me where the whale snout location was. Prior to that, I'd never seen or read anything on it's whereabouts. On my first visit, the ocean mural was still there but the whale snout was gone. The current owners of the market informed me that it was taken down for safety reasons. 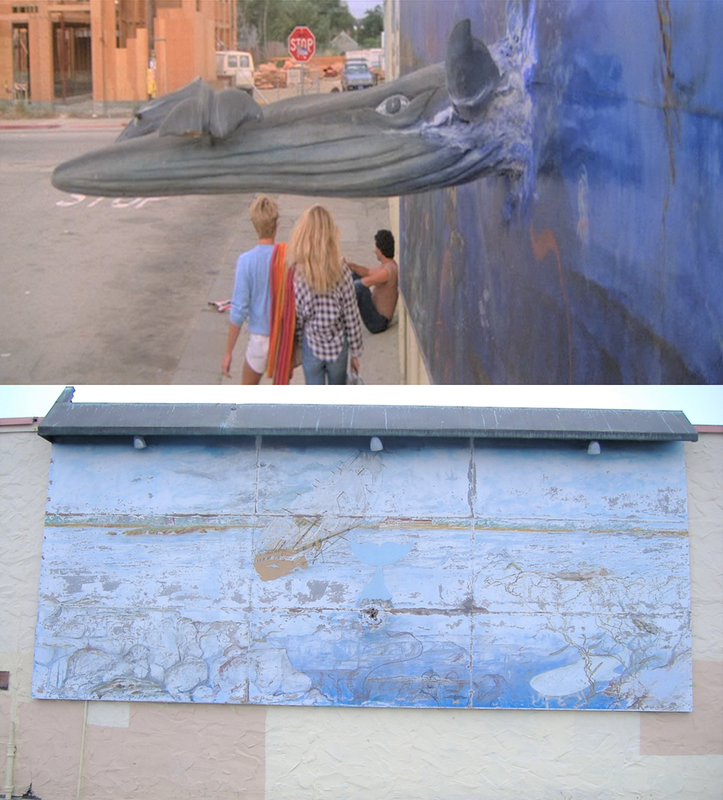 On my second visit to the location in 2013, the mural was gone as well and the spot it had been at was painted the same color as the rest of the building, leaving no indication that it was ever there. One cool thing about this location though, is that you can actually see the building that's across the street being constructed in the movie. The clubhouse was built in 1911 as the Casa del Rey Golf and Country Clubhouse. It closed in 1930 and then re-opened again in 1935 as the Pogonip Country Club. It was during this time that the golf course was converted to polo grounds. In 1936, a pool was built next to the clubhouse but it was filled in at some point during the mid 80's. The outline of the pool is still visible today. 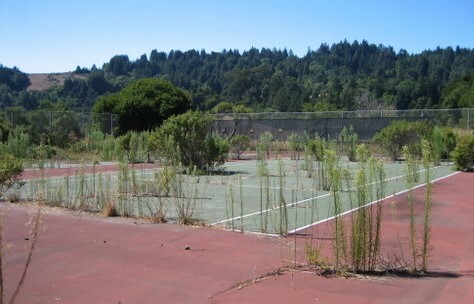 There were also tennis courts constructed which are still there, however they're overgrown with vegetation and have been unplayable for sometime. Today, the clubhouse is part of the 416 acre Pogonip park and trail system and provides spectacular views of the city of Santa Cruz down below. For the film, only the exterior of the clubhouse was used. 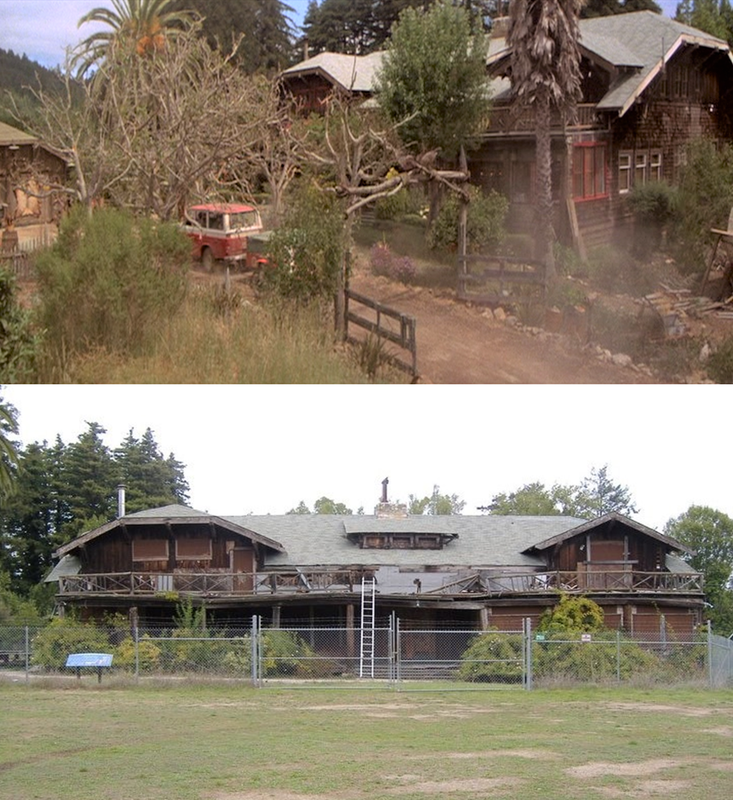 The interior shots of Grandpa's house were filmed on stage 15 at Warner Bros. Studios. 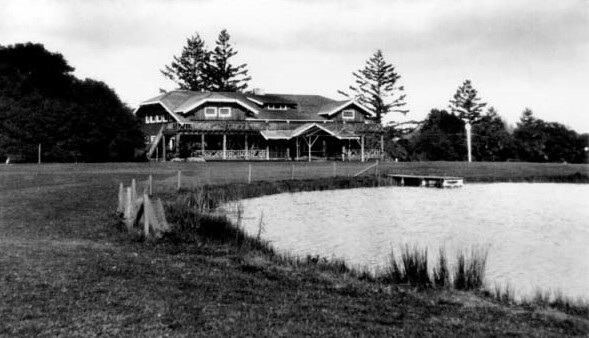 An old photo of the clubhouse, when it had a pond in front. A recent photo of the tennis courts. At the time of my visit, it was called the Santa Cruz Bay Company. 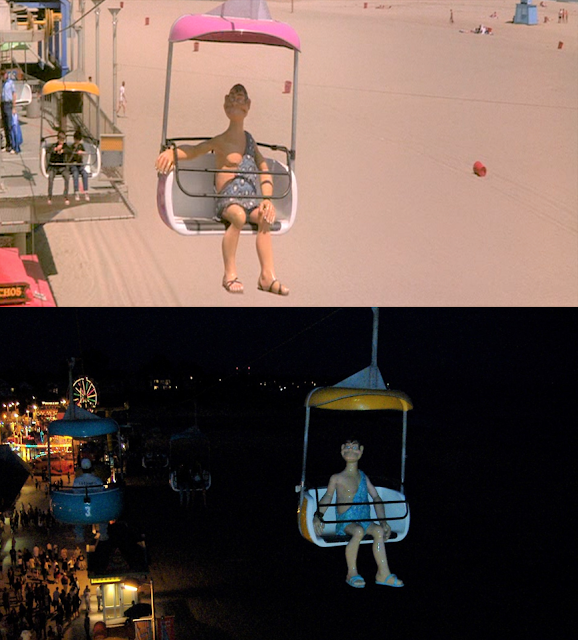 It's located on the Santa Cruz Municipal Wharf, just a stone's throw from the restaurant Lucy and Max dine at later in the film. 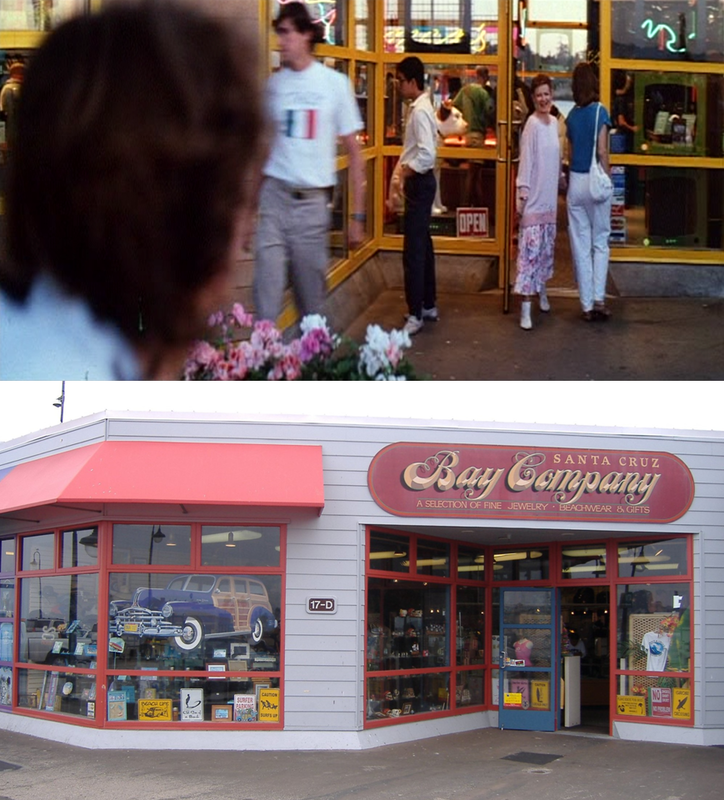 The original location of the comic book shop, as well as where it was located during the time of filming, was 707 Lower Pacific Ave. Santa Cruz, Ca. 95060. Not quite on the boardwalk, as the movie suggests. To block the street in front of the shop from view, they put up a fascade. Since filming, the comic book shop has moved twice. The first due to the shop being damaged beyond repair in the 1989 Loma Prieta earthquake. When Sam first walks into the comic book shop, a rare Laffing Sal can be seen (and heard) behind him. There was no Laffing Sal at the comic book shop when I visited in 2007, however, a different one can currently be found on the boardwalk, near Neptune's Kingdom. 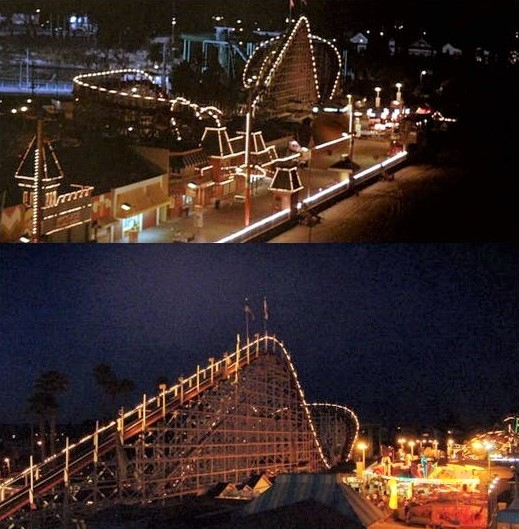 It was purchased in a 2003 auction for $50,000 by Charles Canfield, president of the Santa Cruz Beach Boardwalk. Joe Ferrara, the owner of the comic book shop can be seen in the background at the pinball machine, the second time Sam visits the shop. The "Destroy All Vampires" comic book featured in the film, can still be seen at the comic book shop today, on the wall behind the counter. They even allow Lost Boy fans to pose for a picture with it if they'd like. While flipping through a "Sad Sack" comic, freshly shoplifted from the Frog brothers comic book shop, two members of a rival gang are sucked out of their 1961 Plymouth Valient. This spot is one of, if not the best elevated view of the boardwalk. The interior of the cave was filmed on stage 12 at Warner Bros. Studios. The cave exterior was filmed roughly 270 miles south of the boardwalk, in Rancho Palos Verdes. 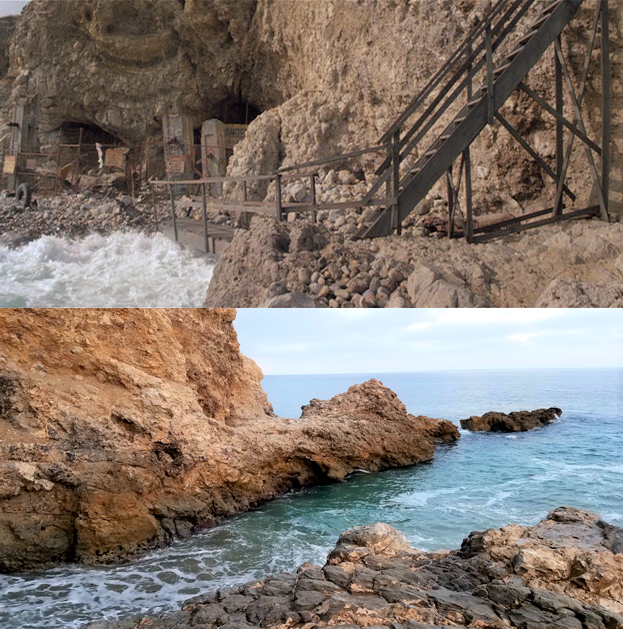 The production built stairs that only went part of the way up the cliff. 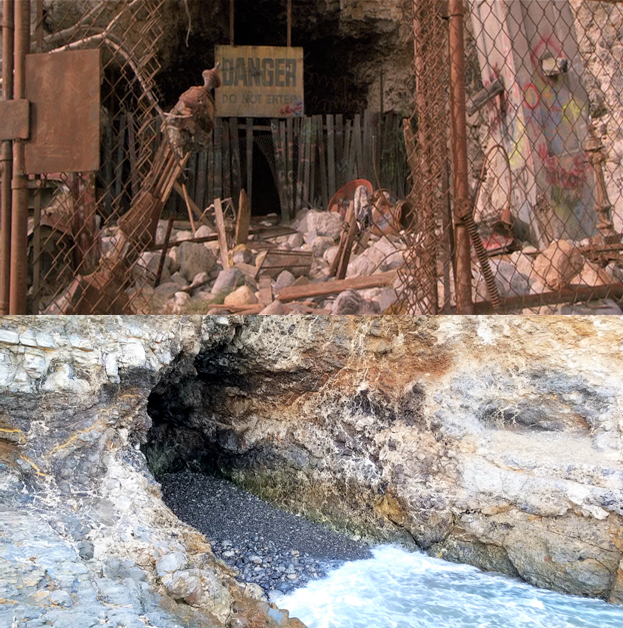 Aside from The Lost Boys, the cave can also be seen in Batman: The Movie (1966) and Charlie's Angels (2000). 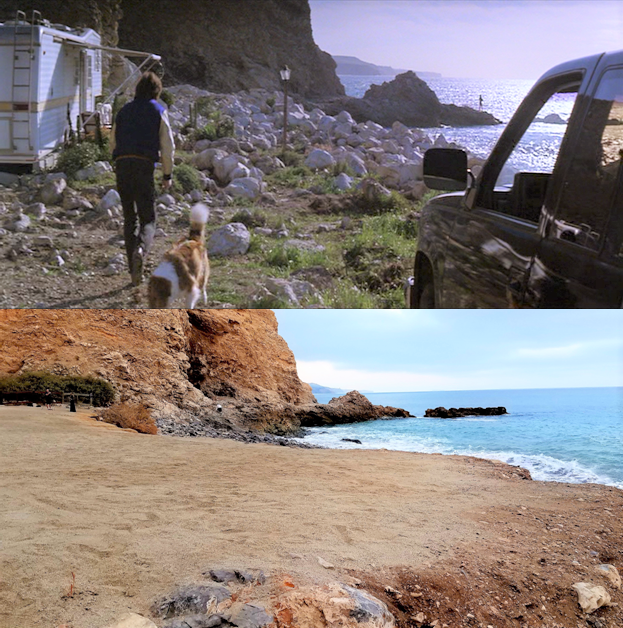 Martin Riggs' trailer from Lethal Weapon 2 also sat next to the cave. 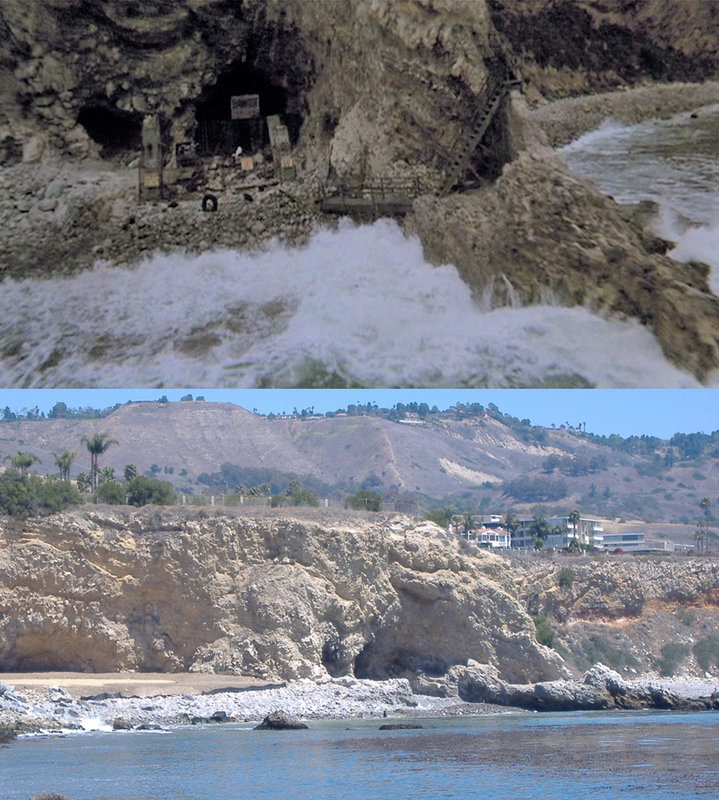 The cliff above the cave used to be home to Marineland of the Pacific. It operated from August 28th, 1954 to February 11th, 1987. 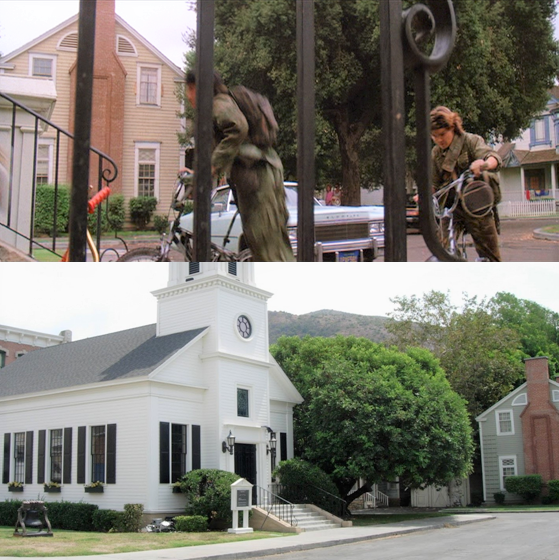 During that span, episodes of The A Team, The Beverly Hillbillies, The Lucy Show, The Munsters, The Partridge Family, Sea Hunt, The Six Million Dollar Man and Wonder Woman were filmed there. The last remaining Marineland structure was removed in 2006. 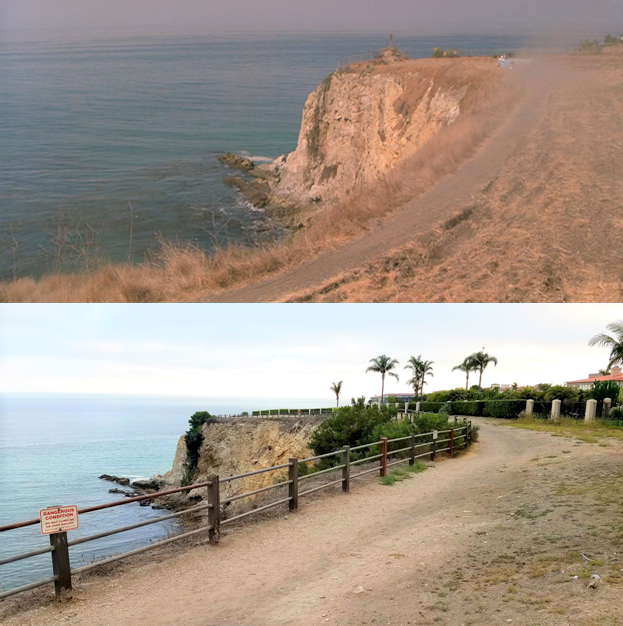 In 2007, construction began on the Terranea Resort and it was completed in 2009. 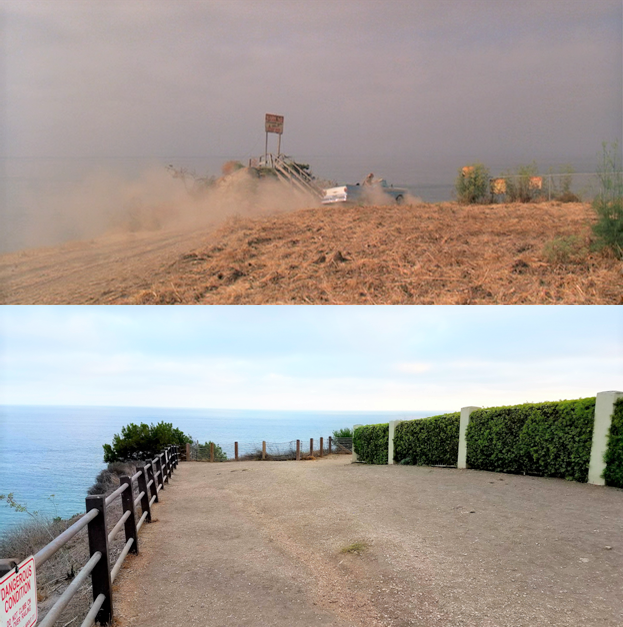 Also above the cave, sits the Vanderlip Park which has walking trails and breathtaking views of the ocean as well as Catalina Island on a clear day. 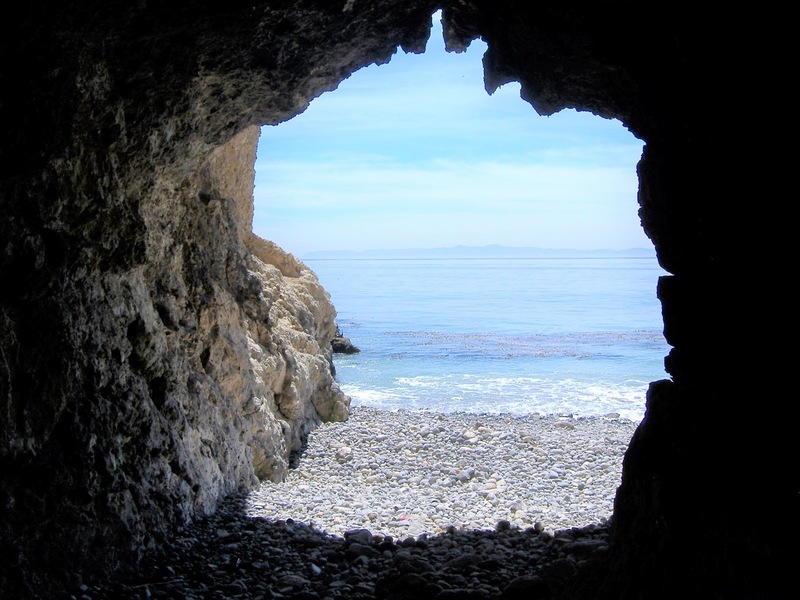 Looking out of the cave with Catalina Island visible in the distance. 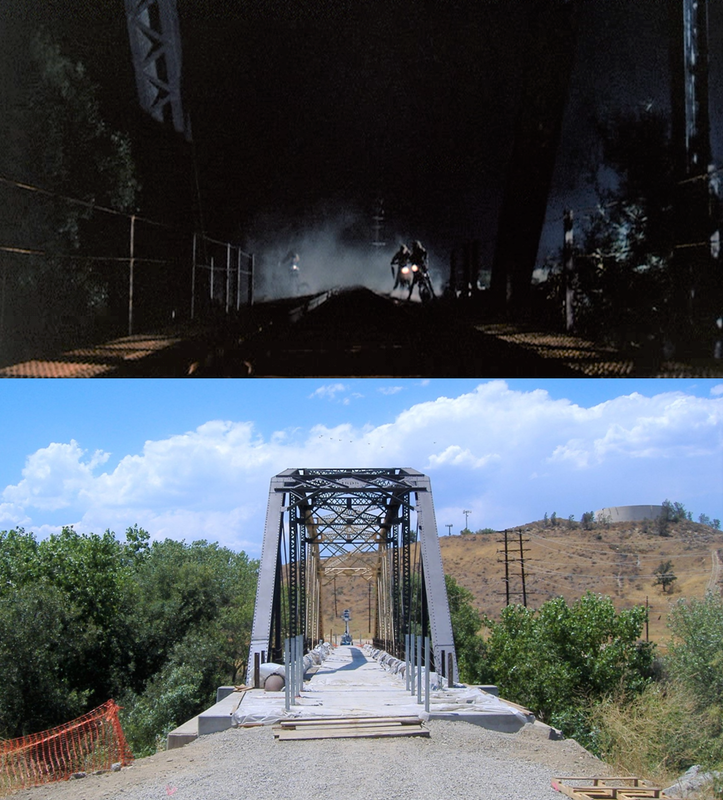 During my first visit in 2007, restoration work was being done to the trestle and path. When I re-visited in 2013, the project was completed. 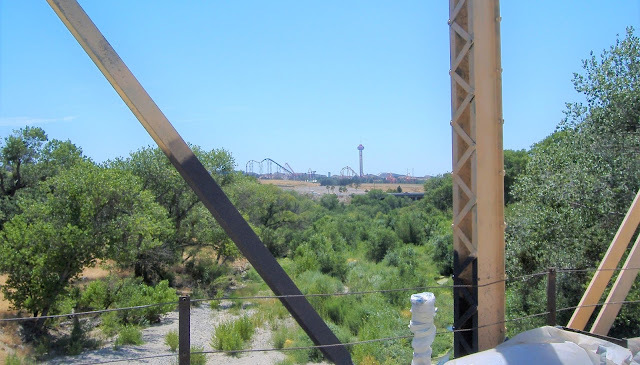 Six Flags Magic Mountain is visible from the trestle, just across the I-5. Looking at Magic Mountain from the trestle. As far as I know, this was the only outdoors scene filmed on the Warner Bros. backlot, with everything else being shot on location. This is awesome. Lost Boys is my favorite horror movie! Thanks Rhianna, it's one of my favorite's too. The inside of the cave I believe was a built set at Warner Brothers Studio. They built only three walls and would rotate them during filming. The bridge the guys hung off of was filmed at the location above however, when they are on the bottom and drop that was a built set at Warner as well I believe. Absolute favorite movie of all time. I lived in Santa Cruz ten years ago and sometimes wish I had stayed! Brilliant work finding and posting all of these. Well done! 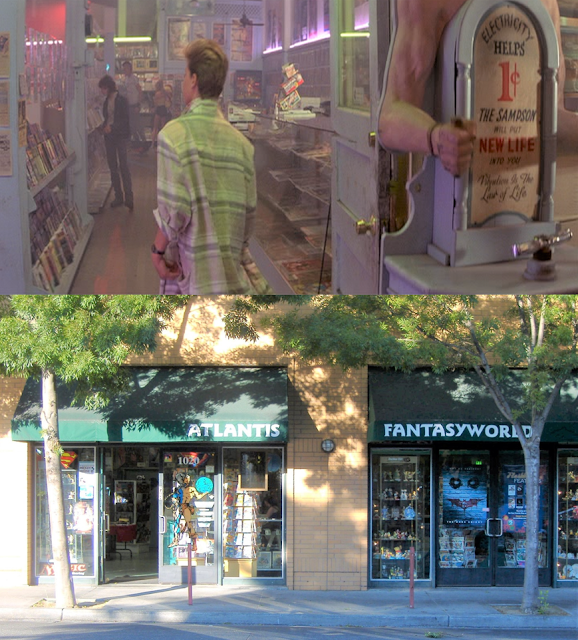 I was wondering where they filmed one of the last lost boys after Corey Haim passed- The beach was beautiful and I tried to look up the bookstore cause I saw an address there not no luck not even with that torn down asylum. I'm on my way to the area. Are we aloud to enter through the resort to see the cave? I love how the SC boardwalk barely changed. Defiantly a fun place to go to, the foods really expensive though. The movie just came on a few hours ago, such a great feeling of nostalgia to watch, wow! Its been hard to find movies that had the same sense of adventure like this movie, and so many others in the 80's which was THE DECADE where movies embodied that. 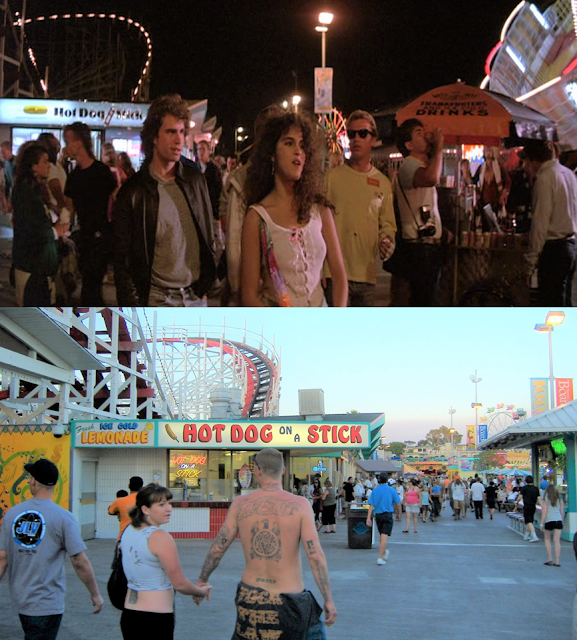 My two favorite things..Vampires and the boardwalk! I LOVE the pictures! Thank you for posting! This is too awesome! One of my favorite films. My husband grew up in Santa Cruz, and you nailed it. Thanks for the awesome comparison and all your hard work! We have literally just moved to Santa Cruz and I'm thrilled! The Lost Boys is one of my all time favorite movies! Hopeful I can visit a few of the haunts listed above! I wonder if visitors can get close enough to Grandpa's house for photo opps? Christine Marie Chen, there is a fence surrounding the building but that should be plenty close enough for a good photo op. Thanks for your response! Sorry I didn't see it until just now! Hope to make it over there possibly next week! Fantastic stuff, that dude in the Gi Joe shirt on the boardwalk is hot. I'm pretty sure everyone who's seen that pic thought the same thing. Thanks for saying so!!! I'm heading to SanDiego then- think I might stop through for the event! One of my favorite movies! Love these pictures! Great website too. I've enjoyed looking at all of these pictures. Well done! Thank you Liz, I appreciate it! Really wish I'd found this site before I went on my trip to Northern California from UK! Next time, I wanna smoke a doob in the cave listening to 'lost in the shadows'! Great pics! One of my favorite vampire movies of all time. I'm looking for the area that was used in the bonfire kill scene. I wonder if the tree they got up into is still there. Of course it could've been just a studio movie set. Very well done! One of my favorite vampire movies. Watching it right now as I type this! One location I'm still looking for is where they filmed the bonfire scene. I wonder if that big tree that they got up into is still there. Of course, it could be just a studio back lot or something. 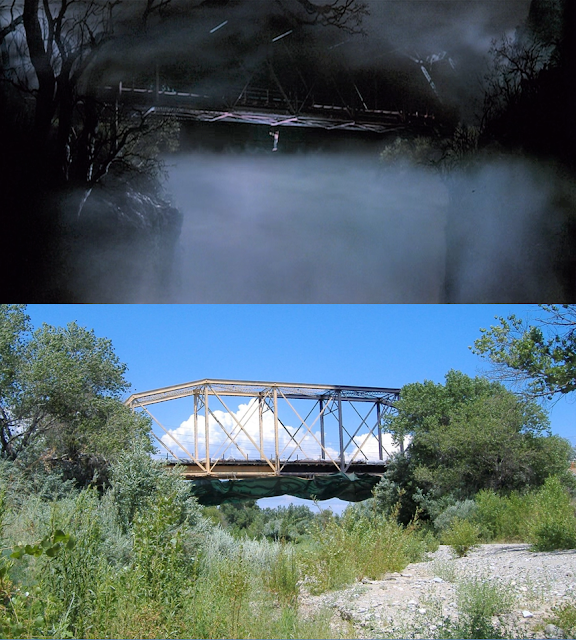 That's one of the two locations I'd love to know from the film. If I find out I'll definitely post! Thanks for the site and i took your advise and managed to find the cave. The beach is public below the Terranea Resort so no need to be a guest. On arrival at the resort head to Nelsons restaurant and follow the path to the beach. Its a 10 minute walk. The outside of the cave looks just like it does in the movie!